Shelf Inflicted: You're Old, I'm Old . . . Get Used to It! 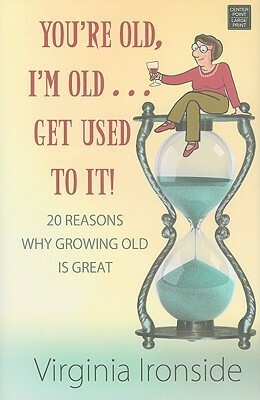 Wry essays about the advantages and indulgences of aging. No matter what they say, sixty will never be the new forty. But sixty- five-year-old British writer Virginia Ironside is determined to convince people that getting old is not so bad-even for a Baby Boomer who interviewed the Rolling Stones and Jimi Hendrix early in her career. In her first nonfiction book published in the United States, Ironside explores the many unsung benefits of aging. There are ailments, but there are also fabulous meds. There are grandchildren- your reward for not killing your children. And then there's "wisdom," the random accumulated knowledge you can label as such precisely because you are old. You're Old, I'm Old . . . Get Used to It! celebrates scattered memory, frequent naps, and mercifully lowered expectations. Ironside, an "agony aunt" with a plainspoken wit, is a convincing spokesperson for the advanced years. The book's easy-to-browse format, clever line drawings, and self-deprecating charm make this a fantastic read for fans of Judith Viorst, Nora Ephron, and anyone who can appreciate the humor in longevity. I couldn’t resist picking this book from the “Spring Picks” table at my local library. Granted, I’m not quite as old as the author is, but I’ll be getting there before long and I was curious to read one, never mind twenty reasons why getting old is so great. The smiling old lady sitting on top of an hourglass with a glass of wine in her hand doesn’t look too unhappy about her rapidly passing years. And I was happy with the comfortable-sized large print. It looked to be a funny book, making light of something that happens to all of us. And it was funny, for the most part. I just wish she didn’t start out discussing ailments. I’m not yet ready to think about colostomy bags, arthritis, walking with a cane, and the anxiety that creeps up on older people who were once fearless. On the plus side, older people often become more confident. They don’t mind seeing films by themselves or walking out during the first 10 minutes if they are not captivated. Life is definitely too short to sit through bad movies! Changes in memory occur as we age too. We tend to forget a lot of useless information as we get older. One of the nice things is forgetting the plots of books and films from years ago, making them feel new and fresh upon revisiting. There is very good advice to those who are lonely, and tips for looking good when there’s no hair left to comb. Though aging is a universal thing, the author’s British perspective highlights some of the differences in European and American health care systems, and work and retirement. I just hope that when I get old I won’t be afraid to drive to my favorite Mexican restaurant, my stomach will be able to handle tacos and margaritas, and I won’t be sitting on a park bench sipping prune juice and talking to pigeons.